Portland, OR. Christmas Ship owners are getting ready to set sail for their 64th year as residents make plans to watch the colorful flotillas during the parade’s 2018 holiday season. 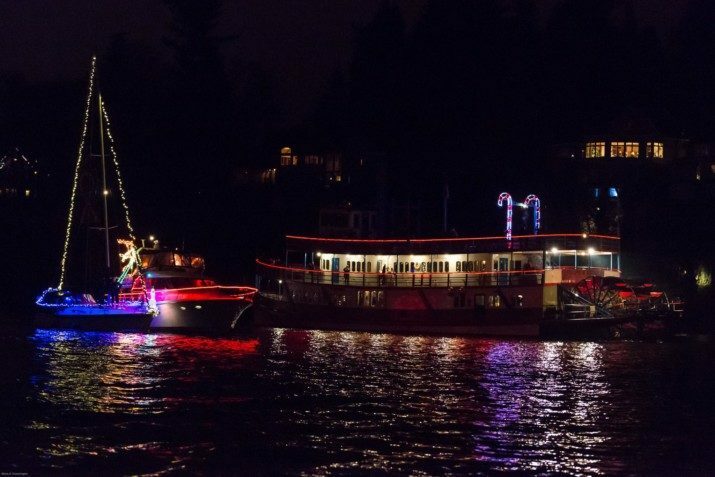 The Christmas Ship Parade will launch Friday, November 30th, in North Portland Harbor. The parade will run for 15 nights through Thursday, December 20th. The flotilla has six nights off, so check the Columbia and Willamette River schedules. The boats, 14 to 65 feet long, are brightly decorated for the holiday season. Up to 60 holiday boats are expected to make up the two fleets. The schedule details for each night list some of the best viewing locations. Sometimes that may be from a shoreline park or it may be from the warmth of a restaurant overlooking the river. On the Willamette, you always have the opportunity to see the ships from a dinner cruise. If you have boat that can run at a speed of at least 6 knots, and you decorate your watercraft, you’re welcome to join the Christmas Ships parade for one night or all nights. To see some of the benefits of joining the parade, visit: Benefits. To sign up, visit: Sign Up. The privately owned vessels come from Portland, Vancouver, McMinnville, Salem and Hood River areas. Some of the ships owners have been part of Christmas tradition for more than 30 years with many being part of the Christmas Ship fleet for over 20 years. Each skipper is responsible for their own expenses, including fuel and insurance for their vessels over the two weeks. This can run into the hundreds of dollars, which in itself is a testament to the dedication and enthusiasm the Christmas Ship skippers bring to the organization, and the community. The organization accepts donations to help cover the cost of maintaining, managing and promoting the organization, but none of these donations go to the skippers, their crews, or their boats. Christmas Ships, Inc. is an all-volunteer organization, with no paid staff or officers, just a large group of friendly individual volunteers/skippers who give back to the community they love. All of us from the Christmas Ship group urge your support to keep the Parade afloat. Your donation helps to sustain the parade that sails on the Columbiaand Willamette Rivers annually. Our lighted boats bring holiday spirit to thousands of viewers in the area and a showcase event for your customers and guests. Our members pay all of their own expenses, from decorations to operating costs. It is a huge time commitment but we all enjoy the Parade season. Donated funds help to defray the cost of administering, maintaining and promoting our non-profit organization. Christmas Ships, Inc. is an all-volunteer organization, there are no paid staff, all donations are returned to the community through the continued existence of the Christmas Ship Parade. This website is used extensively by our visitors to make reservations for restaurants to watch the Christmas Ship Parade and to plan home parties to view the fleet. Please consider sending your donation today. We thank you in advance for your help in making this year’s Christmas Parade the best ever. We list our contributors on our Supporters page (unless you choose to remain anonymous). Although we are a non-profit organization (with IRS 501(c)(4) status), we are not a charitable organization. Personal donations are most likely not tax deductible. Please check with your tax professional.